This article is about buildings made predominantly out of steel. For other uses, see Steel building (disambiguation). Steel building on a farm in Shenandoah County, Virginia. A steel building is a metal structure fabricated with steel for the internal support and for exterior cladding, as opposed to steel framed buildings which generally use other materials for floors, walls, and external envelope. Steel buildings are used for a variety of purposes including storage, work spaces and living accommodation. They are classified into specific types depending on how they are used. Steel buildings first gained popularity in the early 20th century. Their use became more widespread during World War II and significantly expanded after the war when steel became more available. Steel buildings have been widely accepted, in part due to cost efficiency. The range of application has expanded with improved materials, products and design capabilities with the availability of computer aided design software. 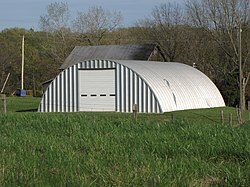 Some common types of steel buildings are "straight-walled" and "arch," or Nissen or Quonset hut. Further, the structural type may be classed as clear span or multiple span. A clear span building does not have structural supports (e.g. columns) in the interior occupied space. Straight-walled and arch type refer to the outside shape of the building. More generally, these are both structural arch forms if they rely on a rigid frame structure. However, curved roof structures are typically associated with the arch term. Steel arch buildings may be cost efficient for specific applications. They are commonly used in the agricultural industry. Straight-walled buildings provide more usable space when compared to arch buildings. They are also easier to blend into existing architecture. Straight-walled buildings are commonly used for commercial, industrial, and many other occupancy types. Clear span refers to the internal construction. Clear span steel buildings utilize large overhead support beams, thus reducing the need for internal supporting columns. Clear span steel buildings tend to be less cost efficient than structures with interior columns. However, other practical considerations may influence the selection of framing style such as an occupancy where interior structural obstructions are undesirable (e.g. aircraft hangars or sport arenas). Long Bay buildings are designed for use in bay spans of over 35'. They use prefabricated metal frames combined with conventional joists to provide larger openings and clearances in buildings. There are five main types of structural components that make up a steel frame - tension members, compression members, bending members, combined force members and their connections. Tension members are usually found as web and chord members in trusses and open web steel joists. Ideally tension members carry tensile forces, or pulling forces, only and its end connections are assumed to be pinned. Pin connections prevent any moment(rotation) or shear forces from being applied to the member. Compression members are also considered as columns, struts, or posts. They are vertical members or web and chord members in trusses and joists that are in compression or being squished. Bending members are also known as beams, girders, joists, spandrels, purlins, lintels, and girts. Each of these members have their own structural application, but typically bending members will carry bending moments and shear forces as primary loads and axial forces and torsion as secondary loads. Combined force members are commonly known as beam-columns and are subjected to bending and axial compression. Connections are what bring the entire building together. They join these members together and must ensure that they function together as one unit. ^ "Steel Framing: Meeting California's Residential Energy Efficiency Standards". Web.archive.org. Archived from the original on 2007-02-10. Retrieved 2009-10-14. ^ "NRC Institute for Research in Construction - IRC - NRC-CNRC". Irc.nrc-cnrc.gc.ca. 2009-10-02. Archived from the original on 2009-02-17. Retrieved 2009-10-14. ^ "The Three Types of Steel Buildings". SteelBuildings.org. Retrieved 7 May 2013. ^ "Prefabricated Building Construction Systems Adopted in Hong Kong" (PDF). Retrieved 24 June 2015. ^ Armstrong, Robert (5 December 2011). "Steel Building Kits : Erecting the Frame". Absolute Steel. Retrieved 11 October 2014.